UNITED NATIONS, September 20 -- While the UN on September 19 told Inner City Press it has "carefully sidestepped" whether Palestine as an Observer State could automatically join the International Criminal Court, within the UN of Secretary General Ban Ki-moon are worries that if Palestine is declared a statement, the UN Relief and Works Agency for Palestine Refugees in the Near East (UNRWA) apparatus would have to be dismantled as the Palestinians would not longer be "stateless." 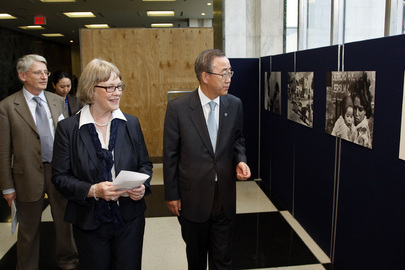 After the chief of the UN Treaty Section Gabriele Goettsche-Wanli on September 16 told Inner City Press that Ban Ki-moon would have to decide if Palestine is a state for purposes of the ICC's Rome Statute, Ban's spokesman on September 19 refused to confirm this, claiming instead that the question had been "carefully sidestepped." A simple review of the September 16 UN webcast shows that the question was, in fact, answered, based on the UN Office of Legal Affairs written statement of Practice. While much focus has gone to which Security Council members beyond the United States would vote against or abstain on Palestinian membership in the UN -- "Colombia is tricky," one well placed Polital Coordinator told Inner City Press as an example on Monday -- the impact on the large UNRWA structure has been much less talked about. But some long time UN hands say that the premise of the UNRWA operations is that the Palestinians are stateless, and that a vote in the General Assembly to grant non-member Observer State status could end that -- and UNRWA. Watch this site. Spokesperson Martin Nesirky: Well, I am privy to what happened at the press conference, and I know that that topic of any application in this regard was carefully sidestepped because this was not the topic of the press conference. So, let’s try any… are there any other questions related to the readout that I’ve just given?